Saint Peter the Apostle Catholic School is the ONLY Catholic school in Savannah with a competitive robotics team! 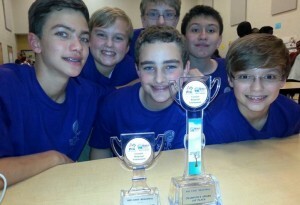 Our award-winning robotics program began in the fall of 2011. Students from 4th through 8th grade are eligible to participate in the Robotics Club and vie for a spot on the Robotics Team. Saint Peter’s has 10 EV3 robots thanks to fundraising by the Home and School Association and a generous donation from an anonymous parishioner. We also have 4 older NXT robots purchased through Home and School Association funds. “Education today relies so much on technology, and Robotics is integral to STEM education. 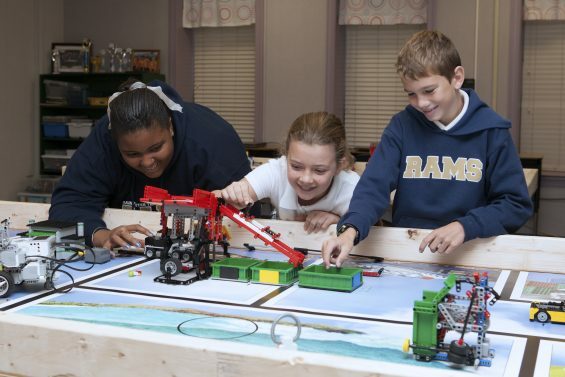 Students not only design, build, and program robots, but also analyze scientific problems, research and present solutions, and learn all about teamwork,” said Robotics Coach Alice Wood. In the near future Saint Peter’s is planning to implement robotics education into the curriculum. Currently we offer classes during the middle school-directed learning periods on Tuesdays and Thursdays. Next competition: Super Regional in Warner Robins, Georgia on January 23rd. This is an all-day competition against teams from around the state.